Philadelphia has made great strides in its efforts to become a more sustainable city. Most recently, the city government announced it will be powered by 100 percent renewable energy by 2035. The city’s green works sustainability plan, transportation plan, and city-wide vision plan lay out ambitious goals. Over the past decade, what have been Philadelphia’s major contributions to the sustainable city movement? What have been the big wins? And where does the city still need to improve? Philadelphia had a vast network of rivers, streams, and creeks, which in many cases were supplanted by underground sewers. These sewers erased the city's hydrological foundation. Green City, Clean Waters is not quite undoing this system but introducing a new geography of green infrastructure that is not only shaping how the city ecologically functions but also how it looks. The program has produced fantastic parks and greenways. That's a credit to the leadership: Howard Neukrug, director of watersheds and then commissioner of the water department, who instigated a lot of this; and Mami Hara, ASLA, his deputy for years, who is now the water chief in Seattle. If you talk to engineers, they’ll say, “well, we can only put an underground cistern," which works from a water quality point of view, but doesn’t provide the other benefits that green infrastructure produces: shade, biodiversity, and the like. This is the problem we need to address in the future. As you mentioned, Philadelphia's landmark green infrastructure plan -- Green City, Clean Waters -- and the Rebuilding Community Infrastructure program have led to the creation of more than 850 greened acres. A greened acre absorbs up to one inch of rainfall through trees, rain gardens, bioswales, and green roofs. What does the program need to accomplish next? 800 acres is less than 10 percent of the total required by the consent agreement, which is 9,300-plus greened acres. The question is: how do you implement green infrastructure in places where it's the most difficult to implement? There's also an issue of cost: if a greened acre costs $100,000 an acre, that is expensive. Another challenge is hiring a quality workforce who can work on green infrastructure in a way that benefits the most number of people. SEPTA has improved a lot over the years. It’s much more pleasant now to ride trains and buses. We've added many miles of bike lanes. And in a warehouse somewhere, there are thousands of electronic scooters ready to be rolled out. There is a new dynamic for moving around in the city. One of my biggest hopes is the city will dedicate streets or a whole corridor to low speeds, like 15- 20 miles an hour. If you hit a pedestrian at those speeds, they have an 80 percent chance of being unscathed; maybe a bruise, but that’s it. The city could do that along major corridors. 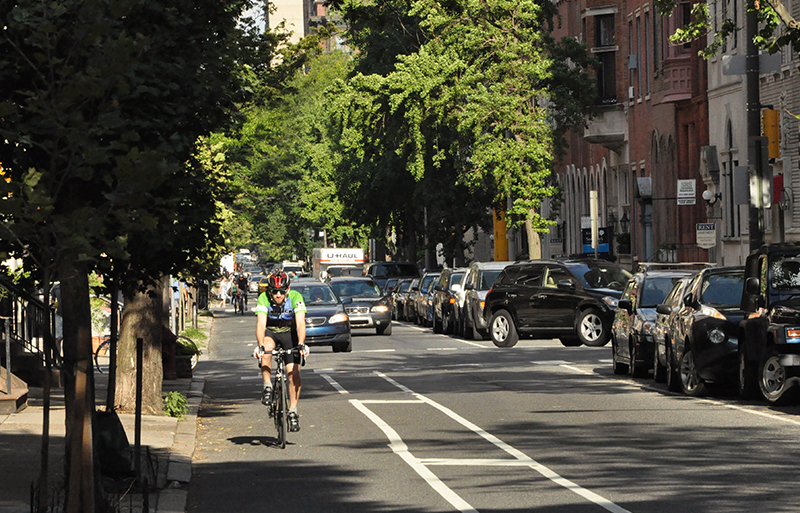 Dedicated street are better than just bike lanes -- they result in greater usage of sustainable transportation options. I don’t think it necessarily follows that improvements will produce gentrification, in part because Philadelphia is one of the poorest cities. For large cities, the median income is one of the lowest, if not the lowest. The city is also predominately African-American, so the infusion, if you will, of white money that can produce gentrification won't affect communities most in need of basic improvements. Perhaps long-term that could be the case. But the program isn't prioritizing in any way, shape, or form projects that can induce re-development in a gentrifying way. The report may point the way towards how you can create equity-- not in terms of income, but at least in terms of access to affordable mobility and parks and recreation, which can elevate quality of life for everyone. Philadelphia is also a hot spot for air pollution, earning an “F” grade from the American Lung Association and ranking just behind Memphis and Richmond for the country's worst air. One in ten Philadelphians have asthma. Furthermore, asthma rates are spread unevenly, largely tracking with areas that are abnormally hot with fewer trees. This is because extreme heat combined with pollution forms dangerous levels of ozone that lead to asthmatic emergencies. How can this city address the inequity of the urban heat and air pollution issue? Green infrastructure is a real solution -- and it was embedded in the precursor to Green City, Green Waters, which was the Green Plan Philadelphia, a landmark report that Mami Hara also guided. The problem in Philadelphia is the tight streets where you can hardly fit a tree, given all the utilities. God forbid you remove a parking space. There’s a tremendous need for vegetation, particularly in South Philadelphia, where it’s very hard to find a tree in any given block. After many years as a principal at Wallace, Roberts & Todd (WRT), where you designed projects such as the Palisades Park and Beach Boardwalk in Santa Monica and the SteelStacks Art and Cultural Campus in Bethlehem, Pennsylvania, you moved to AECOM, where you are now national practice leader for landscape architecture. In your new position, how do you hope to move Philly in a more sustainable, equitable direction? The city has a very robust community engagement process. Philadelphia has a neighborhood-centric social structure. It's great to work with people at that scale to make change. It's all about the scale of the city. Compare downtown Philadelphia to downtowns in other places, compare the widths of streets. I've measured this: it takes me 12 steps to cross most Center City streets. That’s 2-3 seconds. It’s a highly pedestrian-friendly environment because it’s so easy to cross a street. If I had to say anything about Philadelphia that would lead to a better future -- it's we need to take vehicles out of Center City and dense urban areas. Uber and autonomous vehicles (AVs) create on-call circulation that can travel at very low speeds. You no longer need parking. This evolution is inevitable in American cities. Philadelphia is ready-made to lead the way. Interview conducted by Jared Green at the ASLA 2018 Annual Meeting & EXPO in Philadelphia.